This textbook was generated automatically from a GitHub Repo. Visit the repo for more information. IOTA is an open-source Distributed Ledger Technology (DLT) with the following characteristics: permissionless, feeless and trustless. In contrary to the blockchain technology, the IOTA transactions are stored in a form of Directed Acyclic Graph (DAG) called the Tangle. Every transaction is attached to a specific IOTA Address. There are no miners with IOTA protocol to validate transactions. The consensus is achieved by network participants themselves. Each participant that wants to broadcast a new transaction has to approve 2 past transactions and basically attach transaction as a children node. Transactions without children transactions (waiting to be confirmed) are called tips. Pair of unique IOTA address and corresponding Private Key is determistically generated from a Seed. You can generate (253 - 1) different addresses/private keys based on one Seed. Anybody can send anything to the given address however only Seed owner can send funds from IOTA address since only the Seed owner is able to generate corresponding Private Key. IOTA protocol uses One-Time Signature (OTS) for "verifying" whether private key matches to the given address, specifically Winternitz OTS (WOTS). So Private Key (specifically Key Fragments of the private key) is the key component while signing transactions using WOTS. That's the reason why nobody should use IOTA address that have been already funds spent from. New IOTA address (of the given seed) should be generated and used instead. Please note, it applies only to fund-spending. Receiving funds/data is totaly fine even multiple times. To summarize the key concept here. Only Seed is needed to be stored somewhere. Everything else can be safely generated from it: private key as well as address. The Tangle runs on a distributed network of IOTA nodes called mainnet. There are also other separate "Tangles" serving for specific purposes: Devnet, SPAMnet, etc. You can interact with the network via public nodes using collection of public API calls. You can interact with any public node of the given network since all nodes "gossiping" all TXs across the whole network. Nodes are powered by a reference piece of software called IRI (IOTA Reference Implementation) as of now. It is also important to mention that you do not exchange any sensitive information such as Seed with a node. Every sensitive operation such as TX signing is done on client's side and node is just a "messenger" that delivers your TX to the IOTA network. You can even run own IOTA node and actively participate to the whole network. There is a big advantage for developers in that case. Actual implementation of IRI provides an usefull real-time information via messaging platform called ZeroMQ and so developers can leverage that. There are ready-made libraries for major programming languages available and so you have more developer-friendly way how to interact with the IOTA network. Anyway, you can interact with IOTA network using pure API calls without any library. It is up to you. It is difficult to avoid mentioning Ternary numeral system while discussing IOTA at all. IOTA is based on ternary system under the hood and so you have got to be aware of some basic terminology in this respect. You are going to face this fact in any developer-related IOTA guide out there. Ternary has three as its base (aka base 3) as opposted to binary which is base 2. Instead of two states (0 and 1) it recognizes three states (for ex. -1, 0, 1). One Trite is analogous to one bit. It is the smallest digit and has three states. Trit = Trinary digit. You will recognize soon that almost everything is encoded in Trytes in the IOTA world. Tryte is visually represented using [A..Z] alphabets and number 9. One character represents one tryte (here comes 27 possible characters again). Don't get mad, IOTA libraries are going to help us. Trytes = iota.TryteString(TrytesAsBytes) # initializing TryteString type from the PyOTA library - great help while dealing with Trytes/Trits, etc. Anyway, most of the information in the tutorial is language-agnostic and so only implementation details slightly differ across different programming languages. Top-level details are the same regardless programming language you are going to use for your project. Before you can interact with the IOTA network you need an URL of the running IOTA node. There are dozen of directories of public nodes available, feel free to google them. For a sake of this tutorial I use a project thetangle.org. It is a load ballancer that provides you an access to a pool of participanting nodes effortlessly. Disadvantage: you do not know in advance which specific node will process your API call. So in some respect results of API calls may differ since some API calls depend on specific node, such as GetNodeInfo(). Even if a node is up and running it may not be fully prepared to process your API calls correctly. The node should be "synced", meaning should be aware of all TXs in the Tangle. It is better to avoid not fully synced nodes. Once you connect to an IOTA node you should be able to send API calls. However it is better to do some checks in advance in order to find out whether the given node is in good condition or not. IOTA nodes can be run by anyone and so health check is always a good practice. Basic healthcheck can be done via GetNodeInfo() API call. It returns a basic information about the given IOTA node. Please note: When using Deviota Field service then this type of check is quite useless since other API calls of yours may be served by different node that has not been checked obviously. On the other hand, the Field uses some smart techniques under the hood that should prevent you to use node that is not in a good condition. Since the IOTA network is permissionless type of network, anybody is able to use it and interact with it. No central authority is required at any stage. So anybody is able to generate own seed and respective private key/address anytime. It is highly recommended to NOT use online generators at all. The Seed is the only key to the given addresses. Anyone who owns the Seed owns also all funds related to respective IOTA addresses (all of them). Seed and addresses only consists of characters [A-Z] and number 9. Length is always 81 charaters. There are usually also used additional 9 characters in IOTA addresses (so total lenght is 90 then) which is a checksum. It provides a way how to prevent typos while manipulating with IOTA addresses. A seed generation is a process that is based on random quessing of each character in the seed. Of course, you should always use cryptographically secure pseudo-random generator! chars=u'9ABCDEFGHIJKLMNOPQRSTUVWXYZ' #27 characters - max number you can express by one Tryte - do you remember? There is a deterministic function how to get an address from a seed. It is a basically an indexed collection of addresses starting with address at index 0, 1, 2, etc. While generating addresses you should be also aware there are three different so called Security Levels (1, 2 and 3). Each security level generates totally independent pool of addresses. Addresses of Security Level 1 are totally different from addresses of Security Level 2, etc. 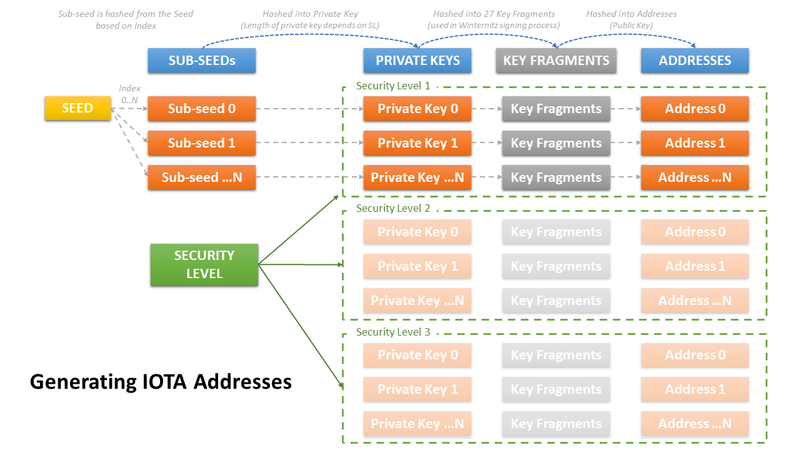 In a nutshell, Security Level indicates how difficult is to generate Private key from the Seed and also what is its size. The higher security level, the more secure (longer) is the given private key. Default Security Level is 2. Most of IOTA wallets uses Security Level=2 and users are usually not allowed to change it. So be carefull while designing your app. # Let's generate 3 addresses using default security level=2. Needless to say, NodeURL is not important for this task at all. As mentioned earlier, some actions are purely done on client's side. This is one of them. Anyway, in case of IOTA library (PyOTA or iota.lib.js) you can directly use an address generator component instead of the whole library. Outputs are equivalent in both cases. As mentioned earlier, IOTA address consists of 81 trytes ([A..Z9] characters) or 90 trytes including checksum. Checksum is useful when you want to make sure a valid address was given (no typos, etc.) and so it is a good practise to encourage user of your app using IOTA addresses including checksums = 90 trytes. IOTA libraries are able to help you to deal with some basic patterns such as validating addresses, generating checksums, etc. You should always make sure your app is dealing with valid IOTA address. Please note, you should also make sure an address is of correct length and consists only of allowed characters. IOTA libraries may slightly differ in their approaches but differences are very subtle and both libraries provide enough functions to validate IOTA address. Transactions are broadcasted in an envelope called Bundle. Bundle may consist of multiple TXs. Bundle is processed by the Tangle as a single entity; meaning only the whole bundle is confirmed by the network (and all TXs within) or nothing. You have to prepare a bundle even if you broadcast single transaction only. Bundle is also described as atomic since every bundle includes all information needed to process it antonomously. Tag: It is an user-defined tag that can be used for searching, etc. There is a secret to be shared. You have to understand one important thing. Bundle is a top level construct that link all related transactions under one entity however the bundle itself is not broadcasted in fact. You still broadcast "only" collection of individual transactions instead. 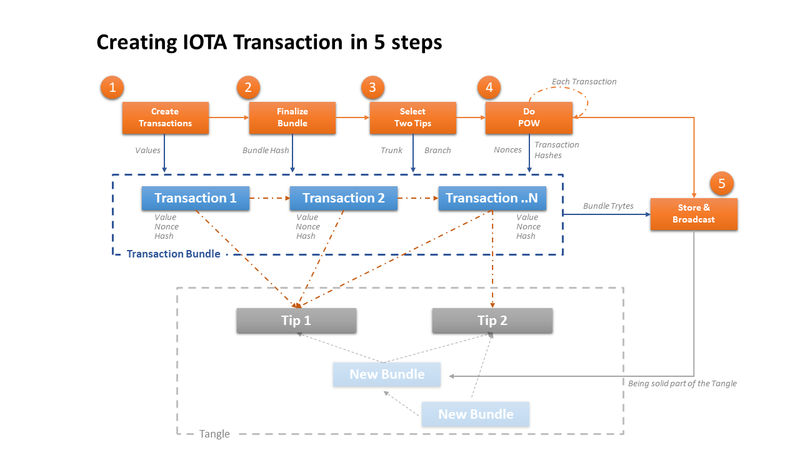 All transactions are recognized to be part of a bundle by the IOTA protocol however any data peering is based on individual transactions (in trytes). In other words, a bundle can be reconstructed anytime from a collection of transactions via fields bundle hash, current index and last index. Let's start with non-value transactions (meta transactions) first since they are a bit easier for starters. Please note, the chapter is divided in two separate sections. In the first section, examples are really close to bare metal (still not too close:) to illustrate the whole process and describing implementation details wherever possible. It is also useful when you want to experiment with different settings at each step (hey "non-existing tips", looking at you). In the second section, IOTA-facing libraries are fully levearged since they are capable to hide all implementation details behind a curtain. Needless to say, if you are not interested in such details then you would probably like to start with the second section. First of all let's create transactions (offline; in memory) and set main fields. BTW: Timestamp field is defined automatically by the IOTA-facing libraries in the process. It is important field while creating bundle hash. In the examples within this chapter we are going to broadcast meta transactions (data only) to two different IOTA addresses. Once all individual transactions are created it is time to prepare and finalize the bundle. While preparing the bundle you need at least to specify list of prepared transaction(s). In case of non-value transactions it is quite straightforward process. However, it is a bit more complicated in case of value transactions - please see later. Please note, finalizing the bundle also means you are no longer able to add new transactions to the bundle post the finalization process. Simply put, bundle hash is a cryptographic "fingerprint" of all transactions in the bundle. It uniquely represents them and so as long as transactions are the same (incl their particular order) the bundle hash is also the same. You may be wondering what is a difference between tag and legacy_tag. Tag includes actualy the tag that was defined during the transaction creation. Legacy_tag is also based on it however it is modified during the normalization process while bundle hashing to be sure that bundle hash is can be securely used while TX signing. That's why the bundle hash is sometimes refered as normalized bundle hash. The bundle refers to the first transaction in collection as tail_transaction. You can perceive tail transaction as an official representative of the whole bundle while checking for confirmation status, etc. Remember, the bundle is an atomic entity and so whatever is done to bundle it applies to ALL transactions within. Tail Transaction in the Bundle is a transaction #0. At this stage you can also see how does our finalized bundle look encoded in Trytes so far. It is also a proof that there is no bundle to be broadcasted itself, only list of transations matter. As mentioned earlier you need to find two tips that you are going to validate together with your bundle for a sake of network participation. This will be outsourced to an IOTA node and so it will be for the first time we interact with the network (via API call get_transactions_to_approve). There is a depth parameter needed. It instructs a node how many milestones it should go in the past while confirming tips. 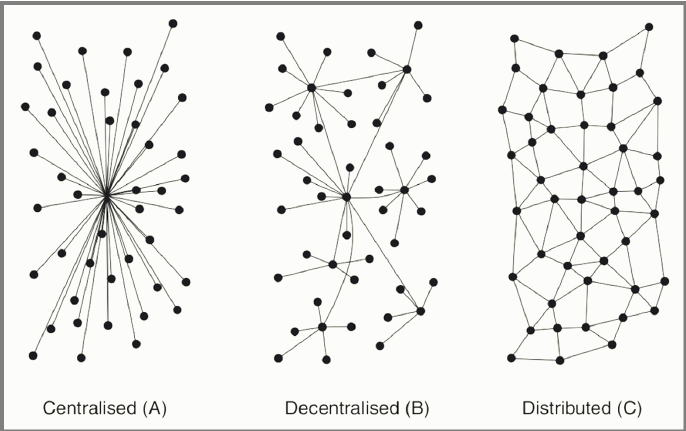 The higher value the better to network however more resources needed. Depth=3 is considered to be well-balanced compromise. Higher value than depth=10 will probably throw an exception depending on node's configuration. It should return two selected tips as branch and trunk transactions. Those transactions will be used while broadcasting the bundle. Proof of work is a relatively simple cryptograhic puzzle to be solved. It represents energy-based costs of your transaction. It also helps to minimize risks of some attack vectors to the network. This task can be also outsourced to IOTA nodes. In order to perform it you need selected tips, finalized bundle (in trytes) and also Minimum Weight Magnitude parameter. This parameter defines how diffciult the given cryptographic puzzle should be to be accepted by the network. As of now, you should set at least min_weight_magnitude=14 in case of mainnet. Please note, POW is performed per each transaction and so it can take some time. That's why it is not recommended to have more than 30 transactions in a bundle. Once succesfully performed, the modified bundle (list of all transactions in trytes) is returned in order to be broadcasted. Trunk and Branch tips are correctly mapped among transactions within the bundle. Check that trunk of the first TX refers to the second TX, etc. You can eventually also preview what specific fields have been modified using transaction objects. The bundle is ready to be broadcasted and so it also show you all fields/values that will be stored in the network. Now it is time to broadcast the given bundle to the network. List of all transations in trytes returned from the previous step is only thing needed. Once succesfully broadcasted it returns the same input bundle as a confirmation. As mentioned above, IOTA-facing libraries are able to encapsulate all implementation details and so you do not need to care of them anymore. It is usually based on extended API calls that were proposed to be included by IOTA Foundation to make developer's life easier (https://github.com/iotaledger/wiki/blob/master/api-proposal.md). 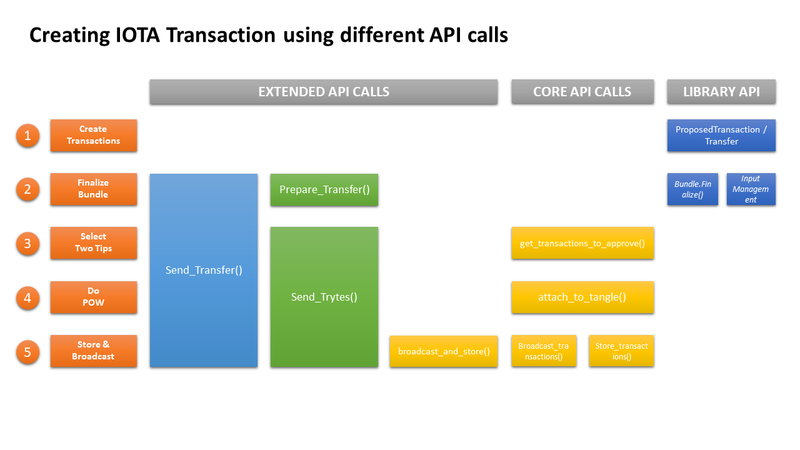 Even if using extended API calls you can still slightly control a level of your involvement in the whole process. From almost no involvement and fully automatic (send_transfer()) to semi-manual approach discussed above. So it is basically your call to decide what works best for you. Now back to our exercise. Here comes a code that basically broadcasts transactions in a single call (send_transfer()) and you do not have to care of any implemenation details that are hidden under the hood. And to complete the picture here is addtional code that uses prepare_transfer() and send_trytes() combo. Meta transactions were discussed in the previous chapter. This chapter describes value transactions which are transactions that transfer IOTA tokens between IOTA addresses. Tokens are fully premined and so number of tokens in the network is given. So transfering tokens means changing their ownership only. All three types have to be part of each bundle otherwise you are under a risk of loosing IOTA tokens. In other words, each bundle should consists of at least one input TX, one output TX and one unspent TX. Total balance of the bundle should be zero since the number of tokens is the same, just token owners have been "changed". Why Alice has to "put" all 100 tokens in the bundle while she is going to actually spend only 20 tokens? The reason is that IOTA protocol uses one-time signature scheme (OTS) for transaction signing while spending tokens. And with every signing process a half of a private key of the given address is revealed. That's why no one should ever spend tokens from the same address again. Please note: for a purpose of this chapter we are going to switch to a test network called devnet. It is the testing Tangle. Tokens are not real and everything you do have no implication to the mainnet at all. However it is stil powered by standard node software and so technicaly speaking it behaves like the mainnet. If you need more info regarding devnet please refer to the official documentation. Everything what has been mentioned in the previous chapter focused on non-value transations is still valid also in case of value transactions however there are several additional tasks you should take care of. Needless to say, IOTA libraries (PyOTA and others) are ready to help you and are able to hide all implementation details in case you would like to. In this case I would encourage everyone to prefer a functionality that is offered by extended API calls, such as send_transfer. Experimenting with value transactions and trying to tweak them does not seem to be a good idea (on the mainnet). Anyway, even in this chapter I am going to describe main tasks that are performed under the hood to be able to understand the whole concept. You may be wondering why only the seed for sender's side is defined. As mentioned above the reason is that the address with tokens is changing with every spending exercise and so you have to find address with tokens that left in a bucket programatically (if any tokens left:). Please note: API call get_account_data consider only confirmed transactions while calculating total balance. So it is better to wait until all transactions are cleared before you send additional tokens. security_level=2) # Let's generate an address using default security level=2. What have just happened behind the curtain? # it returns the balances as a list in the same order as the addresses were provided as input. # you may be wondering why there is imputs=None and change_address=None. Why there are two parts? Since the transaction spends tokens it has to be signed in order to validate the ownership. Signature is generated from the private key and the signature can be observed in the field signature_message_fragment. Here is the thing. Do you remember when different security levels were discussed? There are three security levels available and the given level has the direct impact on length of the signature. Since signature_message_fragment is of the fixed size, if SL>1 then the transaction has to be split to be able to accommodate full signature. The last transaction current_index=3 moves unspent tokens to the first unused address of the given seed. 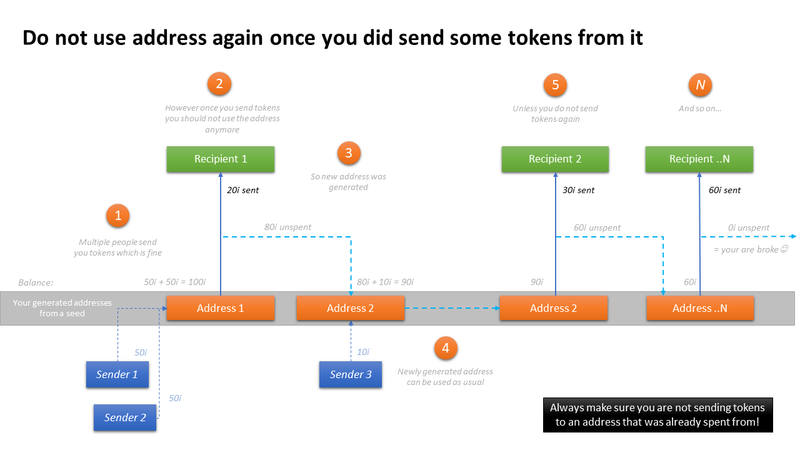 There is also some quick check performed whether resulting number of tokens is zero (no more tokens, no less tokens. Number of tokens has to be balanced). So basically all steps we tried in the chapter had to be done also behind the curtain while using send_transfer extended API call. You can also see that some of those operations may be quite expensive in terms of time while being completely stateless. In real world applications it would be better to save some states (index of last address, used addresses, etc.) to avoid too many expensive operations.